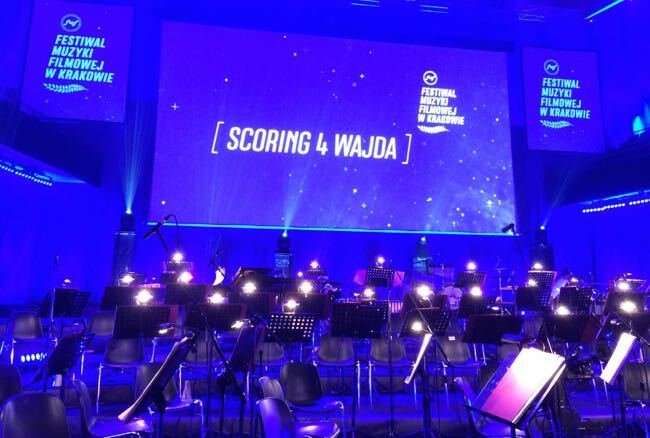 KRAKOW – Andrzej Wajda’s devastating images from his 2007 film “Katyń” and the haunting music of Krzysztof Penderecki formed the emotional heart of the Polish Music Gala: Scoring4Wadja here last night. 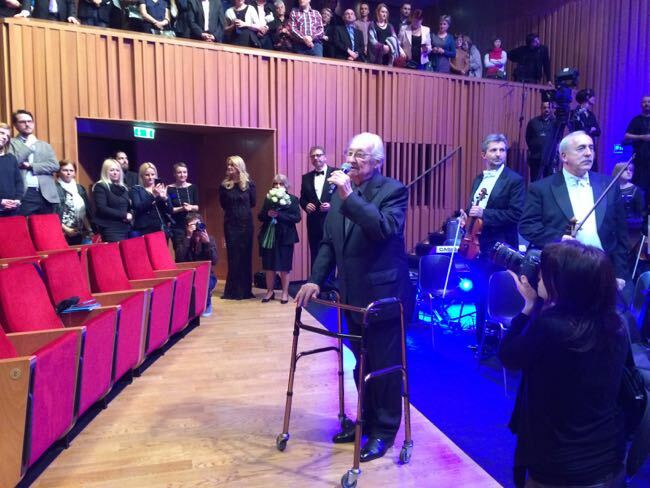 Filmmaker and composer were among the guests of honour at the event, part of the Krakow Film Music Festival, which featured an evening of music from Wajda movies performed by the Polish National Radio Symphony Orchestra in Katowice and the Choir of the Karol Szymanowski Philharmonic in Krakow conducted by Alexander Liebreich. For more than two hours, the giant screen was filled with a range of evocative, moving and witty scenes from Wajda films as the full orchestra played cues and themes by composing greats including Zygmunt Konieczny, Andrzej Korziński and Pawel Mykietyn, who were introduced from the audience, plus Wojciech Kilar, Krzysztof Komeda, and Andrzej Markowski. Kilar’s celebratory “Polonaise” from “Pan Tedeusz: The Last Foray in Lithuania” (1999) kicked things off ahead of the presentation of the first Walter Kilar Award to U.S. Oscar-winner Elliot Goldenthal (“Frida”). A whimsical Kilar cue from “The Revenge” (2002) continued the musical exploration of Wajda films followed by Kilar’s dreamy waltz from “The Promised Land” (1975), the yearning piano and strings of Kilar’s score from “The Shadow Line” (1976), and Zygmunt Konieczny’s imperious choral cues from “The Curse” and “November Night” (1977). A suite from Krzysztof Komeda’s score for “Innocent Sorcerers” (1960) with piano, harp, trumpet and saxophone solos began the second half of the evening after a break followed by a threatening main theme from “A Generation” (1955) and an airey suite from “Roly Poly” both by Andrzej Markowski. Penderecki’s “Katyń” (pictured above) was overwhelming in its stark evocation of horror and Pawel Mykietyn evoked first loss in a suite from “Sweet Rush” (Tatarak) (2009) and then optimism in “Walęsa: Man of Hope” (2013). The evening closed with four pieces by Andrzej Korziński: “Polish All Souls Day” and “The Fate of Man” from “Man of Iron” (1981) plus the main theme from “Man of Marble” (1977) and the bossa nova from “Hunting Flies” (1969) featuring singer Joanna Slowińska. At the end of a powerful and moving concert, a grateful audience stood at length to honour the great filmmaker and Wajda responded with heartfelt remarks before he departed to even more applause. This entry was posted in Film, Krakow Film Music Festival, Music, News and tagged Andrzej Korziński, Andrzej Wajda, Elliot Goldenthal, Karol Szymanowski Philharmonic in Krakow, Krakow Film Music Festival, Krzysztof Penderecki, Liebreich, Pawel Mykietyn, Polish National Radio Symphony Orchestra in Katowice, Wojciech Kilar, Zygmunt Konieczny. Bookmark the permalink.